National League for Nursing CEO Beverly Malone, PhD, RN, FAAN, among America’s most vocal leaders in the national conversation on health care, has been tapped through competitive review for the honor roll of the 2017 Top 25 Women in Healthcare, a prestigious biennial list compiled by the Modern Healthcare. 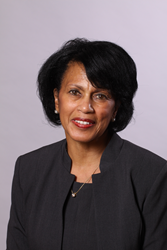 Among America’s most vocal leaders in the national conversation on health care, the CEO of the National League for Nursing,Beverly Malone, PhD, RN, FAAN, has been tapped through competitive review for the honor roll of the 2017 Top 25 Women in Healthcare, a prestigious biennial list compiled by the Modern Healthcare. She will join her colleagues at an awards dinner on Wednesday, July 19, in Nashville, when the group will be formally recognized and also participate in a special Women Leaders in Healthcare Conference the magazine has organized. The Top 25 program recognizes women in a variety of leadership roles, spotlighting their administrative and professional accomplishments, as well as their mentoring and willingness to serve as role models in an industry that, like many others, grapples with gender and other diversity issues. Dr. Malone was notified of her selection in a message from Fawn Lopez, the publication’s publisher and vice president. “It is truly an honor and privilege for me to welcome you to this year's class of extraordinary healthcare leaders and visionaries who are revolutionizing our healthcare system and transforming the healthcare delivery across our great nation,” wrote Ms. Lopez. Dr. Malone has long been in the forefront of policy discussions and fiscal advocacy surrounding the persistent shortage of nurses and nurse educators. She has also promoted the increasingly sophisticated role of nursing in ensuring access to safe, quality, culturally competent care, with a special focus on traditionally underserved and vulnerable members of society. The NLN Academy of Nursing Education; the International Council of Nurses Education Network; the NLN Foundation for Nursing Education Scholarship Program; and the NLN Leadership Institute are just four examples of formal avenues Dr. Malone has helped co-craft to increase opportunities and recognition for League members and others in higher education. They promote and celebrate earning advanced academic degrees and immersion in life-long learning that facilitates nurses caring for patients to the full extent of their practice and preparing to deliver outstanding, culturally competent care in today’s dynamic, complex, technology-rich health care environment.